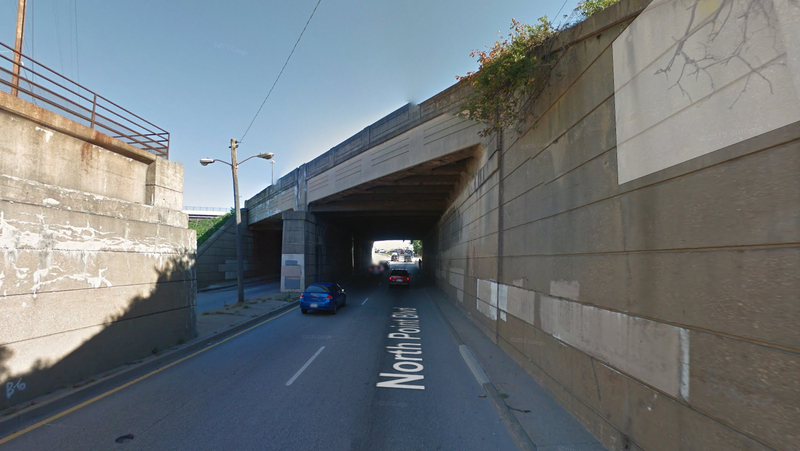 DCI conducted a drainage study for the flooding at North Point Boulevard Underpass located in East Baltimore City between Kane Street and Quad Avenue under the Norfolk Southern/Amtrack Rail Road bridges. There was a sag in the vertical roadway profile located beneath these bridges. Any water trapped in this sag would have to rise four feet before it could overflow. As a result, the roadway was shutdown because of the flooding. DCI developed hydrologic and hydraulic models of the stormdrain system serving this area. Models were first developed for existing conditions to determine the extend of the flooding and to identify upstream areas that were contributing bypass flow. From this existing condition study it was determined. The drainage area to this sag is approximately 39.7 acres. However due to flow bypassing upstream drainage structures this drainage area can swell to 229 acres. As a result the 10 year discharge can rise from 204 cfs to 649 cfs. The bypass flow is coming from four drainage structures. This existing conditions study also included researching existing land records to determine if additional easements are required to accommodate the proposed drainage improvements including both the proposed stormdrain improvements and stormwater ponds. Researching existing city owned as well as privately owned utilities to determine if they may be impacted by the proposed stormdrain and stormwater pond improvements that are being proposed. A cost estimate for relocating those utilities will be included in the investigation of alternates. The results were summarized on a forty scale existing conditions plan. A profile of existing drainage system and showing the existing 10 year hydraulic gradient was developed. Development of a post construction drainage area. A proposed conditions plan that shows the proposed drainage improvements to the North Point Road drainage system. In addition any utility relocation was shown along with any additional easements required. A grading plan was developed for the two pond sites showing existing utilities, utility relocations, existing and proposed contours, natural resources, property lines and existing and proposed easements. Profile of proposed drainage improvements. Cost estimates for each alternate that includes the cost of utility relocations and right of way costs.